In Washington D.C.'s ever-changing political landscape, it's important now more than ever for NASFAA board members to stay up-to-date on key issues. That's why in 2012 NASFAA created the Reauthorization Task Force to help develop policy and statutory recommendations for NASFAA's Board members. For more information about the Task Force's guiding principles, members, and actionable goals, check out the Reauthorization Task Force Charter. Represent the diverse needs of the Association and its membership. In anticipation of the expiration of the Higher Education Act in 2014, NASFAA commissioned the HEA Reauthorization Task Force to consult with NASFAA members and other important groups and agencies to develop recommendations on policy issues and specific statutory changes in the federal student aid programs and their delivery systems. 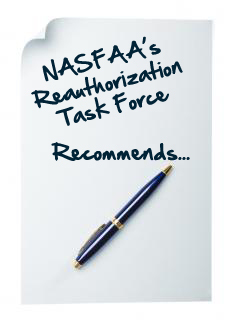 Members of NASFAA's Reauthorization Task Force are an integral part of our organization's robust advocacy efforts. They are leaders in the financial aid field from colleges and universities across the nation. Each member of this dynamic team brings a wealth of knowledge and experience to their advisory role. January 9, 2012 - NASFAA formed a Higher Education Act (HEA) Reauthorization Task Force to develop policy and statutory recommendations for the federal student aid programs and their delivery systems.